Apple's initial mainstream product was the Apple II, introduced in the late 70s and updated in a series of revised models differentiated by a character suffix: first the Apple II+, then the enhanced Apple IIe, the compact Apple IIc, and eventually the 16-bit Apple IIGS, with letters emphasizing its new graphics and sound capabilities. The ill-fated Apple III and Apple III+ were followed by the Lisa (later rebranded the Macintosh XL), both using the same type of suffix naming convention that was also in common use by many other early computer makers. The company named its first Macintosh models with character suffix identifiers: an initial update was called the Mac 512Ke (commonly referred to as the Fat Mac for sporting four times the RAM of the original) and the first major redesign was branded Mac Plus, followed by the Mac SE (for system expansion, the first Mac with a slot) and the Macintosh II in 1987 (the year after Jobs left the company to start NeXT Computer). After continuing this naming system through a series of Mac II models in the late 80s, the company began branching out by delivering new series of Macs, ranging from the Mac LC line (for "low cost color," aimed at education and home buyers) to the low end, nostalgic "Mac Classic" line to the higher end Mac IIx, IIcx, Iici, IIfx, IIsi, IIvi and IIvx. It then introduced a series of Latin-sounding product lines ranging from the consumer-oriented Performa to the middle of the road Centris and '040 powered, higher end Quadra, with each model getting a Sony-style model number such as the "Quadra 650 AV." Systems using a PowerPC processor were given four-digit numbers (as opposed to the original three-digit numbers of Macs based on the Motorola 680x0 chips), and often incorporated "Power" in their name (although mobile PowerBooks predated that convention, so they didn't necessarily use a PowerPC chip unless they sported a four-digit model number). A single new machine architecture might be offered under a dozen Performa model numbers, each with slightly different specifications. 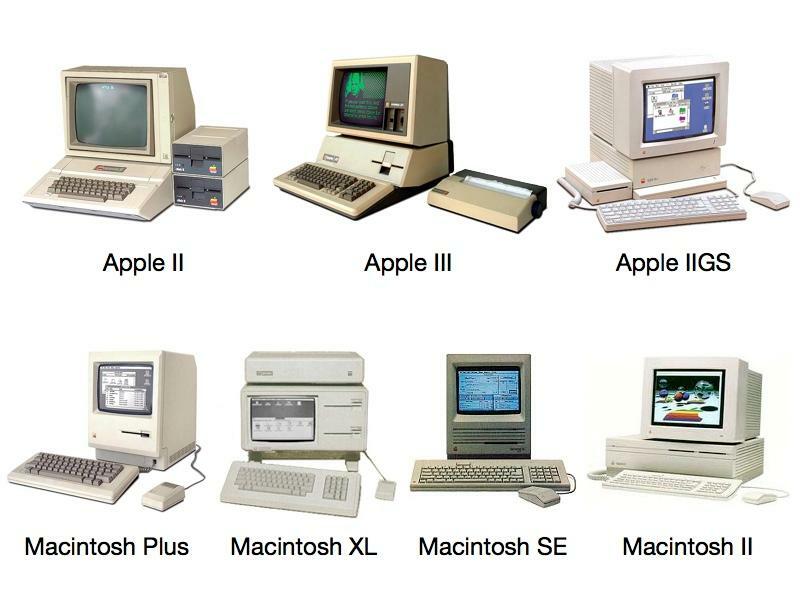 Throughout the 1990s, Apple's product naming resulted in a complex, difficult to understand series of overlapping models and model numbers, each representing a different configuration of hard drives and system capacities. The company's Newton Message Pad and eMate product lines of handheld devices similarly used product numbers to differentiate models, and the company also used the same numbering conventions for peripherals such as its QuickTake cameras and StyleWriter and LaserWriter printers. 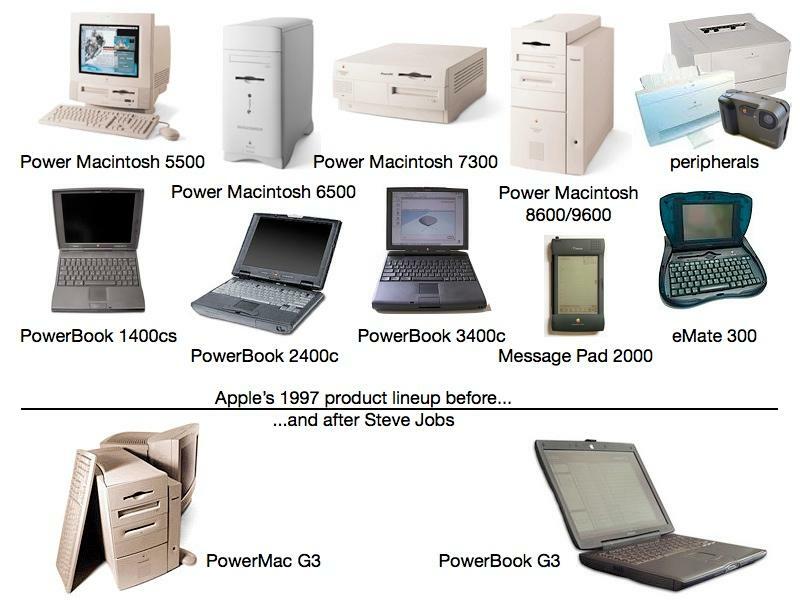 When Jobs returned to lead Apple in 1997, he immediately killed the Mac's confusing model number-names and introduced a single desktop model: Power Macintosh G3, paired with a single notebook, the new PowerBook G3, both highlighting the new, third-generation PowerPC chip. Newton devices, printers and cameras were all axed from the company's catalog entirely. Jobs then introduced the iMac in 1998, followed by the consumer iBook notebook in 1999. 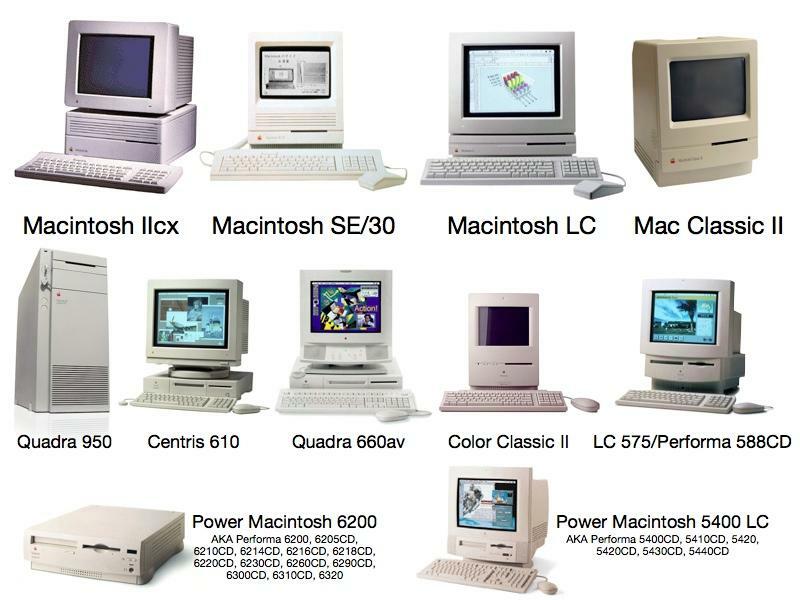 Successive models that incorporated a significantly different processor were appended with G4 or G5, but each generation of Apple's Macs were no longer given unique names with each release. Instead, iMacs and PowerBooks were generally released with an internal naming system that described when they were released (such as "early 2006"), along with an unpublicized architecture name ("iMac4,1"). To the public, a new iMac was simply marketed as the latest iMac. With the shift to Intel processors announced in 2005, Apple's product names got even simpler, with "the new iMac," "the new Mac mini," and new series of MacBook, MacBook Pro, Mac Pro, Xserve and MacBook Air models, none of which drew attention to the generation of their Intel processor, nor features such as a 64-bit architecture, DisplayPort or Thunderbolt. Instead, users buying a Mac simply choose the form factor they want, the screen size, and pick between good, better and best packages, or custom order a specific configuration they want. There's no hierarchy of model numbers or sub-brands to navigate through to find the Mac a users wants to buy. Rather than naming products after their specifications, Jobs' Apple named products descriptively (such as "Mac mini") or after the category of people who would be buying them (Pro). When Apple introduced the iPod in 1999, it continued to remain "the new iPod" through several generations before being named the iPod Classic to differentiate it from the architecturally different iPod mini (and its replacement, the iPod nano) as well as the simple iPod shuffle. Each successive model generation retained the same descriptive product name, without serial numbers or new name suffixes to highlight differences in their chipset or other features. One exception to this rule was the short-lived, premium fourth generation iPod named "iPod Photo" in 2004. It was later renamed "iPod (with color display)," then replaced with the video capable fifth generation "iPod" in 2005, which Apple purposely avoided naming "iPod Video," even as consumers often referred to it as such. When Apple released iPhone in 2007, it paired it with the new iPod touch. While subsequent generations of iPhone got new names alluding to their new features (iPhone 3G) or updated speed (iPhone 3GS) or new generation names (iPhone 4) and new enhancements (iPhone 4S), iPod touch didn't, instead carrying forward the Mac style product name with a parenthetical reference to its generation or model year introduction. A primary difference between the iPhone and iPod touch was that Apple continued to sell different generations of the iPhone in different markets or at different price points. 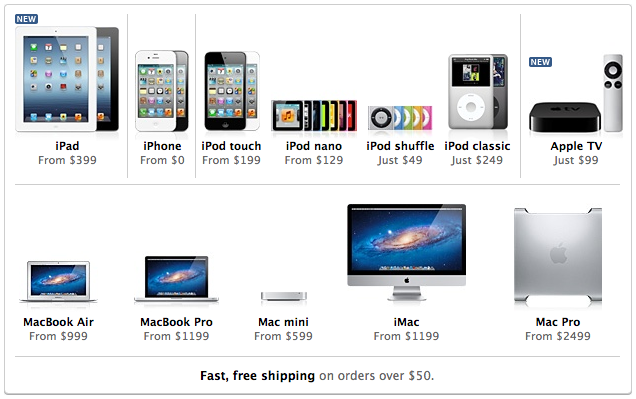 While Apple continues to sell the iPhone 3GS, 4 and 4S, it has only ever sold one new iPod touch model. With the iPad, Apple has historically liquidated the previous model year, rather than selling both an old and new model at different prices. This year, Apple has continued to sell a single iPad 2 while offering a "new iPad," positioning the device somewhere between the naming convention of iPhone and its iPod touch and Macs, which don't get new names and typically don't overlap in sales. This suggests that Apple may begin naming subsequent new iPhone models as simply the "new iPhone," rather than introducing a new "iPhone 5" or "iPhone 4S Plus." Such a move would also help to reduce confusion related to the difference between generations of iPhone, generations of Apple's A4/A5/A5X/A6 system on a chip processor, and the branding of wireless technologies that identify themselves as 3G, 3.5G, or various things that claim to be 4G (despite the fact that no deployed wireless networks actually meet the 3GPP standard for being a true "4G" technology). Another complication is the fact that even among carriers supporting LTE, there is no global consensus on what bands to use. In the US, AT&T and Verizon operate LTE service on different bands, and globally carriers are rolling out the technology on still different bands. Until a single chipset and design can be made to efficiently work across all of them (something that many not happen), Apple is likely to want to avoid confusion with a series of different model names, and instead focus on '"iPhone" as its global brand. Apple's strong brands related to iPod, iPhone, iPad and Mac enable the company to release models consumers can readily identify. The company's entire hardware product lineup fits into a small box on the company's online store page, with each brand clearly differentiated. Windows PC makers offer similarly confusing ranges of products reminiscent of Apple in the 90s. Samsung offers a good example of both, with a website that lists not just 137 different phone models and carrier combinations (not including 14 Android tablets and two Windows 7 Tablet PC offerings) but also 37 laptop models grouped into four "series" as well as a Google Chromebook notebook and an all in one PC model. Samsung isn't even a major PC vendor. RIM also continues to use Performa-style model naming, with BlackBerry Bold models identified as, for example, the 9000, 9650, 9700, 9780, 9900 or 9930 among the 21 models grouped under its six brand names, similar to Nokia's use of numbers on its Lumia Windows Phone 7 model lineup, which includes the 610, 710, 800, 900 and 910. Other Microsoft licenses are using Android-style naming, with new brands from each vendor (such as the HTC Trophy, Mozart, HD7, Titan and Radar). Microsoft effectively prevents its Windows Phone 7 licensees from offering much diversification on specifications, but the product is now offered under more than two dozen brand names and numbers, despite accounting for very few actual sales globally. On different carriers or in different countries, each of these model names is subject to change, too (the AT&T Samsung Galaxy S II is essentially the same phone as the T-Mobile Epic 4G Touch, for example, a nod to the ego of carriers at the expense of consumer confusion). This is in stark contrast to Apple's single brand name for the iPhone 4 or iPad on every carrier, even in cases where there were different chipsets and technologies used (such as an AT&T version and Verizon version). By centering on a single brand name for each major product category it sells, Apple spends much less on advertising and promoting new brands and customers find it easier to find what they're looking for and ask for it by name.